4. Department of Trauma and Orthopaedic Surgery, Federal Armed Forces Hospital Westerstede, Westerstede, Germany. Background: Abdominal operations are followed by adhesions, a prevalent cause of abdominal pain, and the most frequent cause for bowel obstruction and secondary female infertility. This rat study addresses adhesion prevention capability of Adept®, Interceed®, Seprafilm®, and a novel device, 4DryField® PH which is provided as powder and generates its effect as gel. Methods: Sixty-eight male Lewis rats had cecal abrasion and creation of an equally sized abdominal wall defect, and were grouped randomly: A control group without treatment (n=10); two groups treated with 4DryField® PH using premixed gel (n=15) or in-situ gel technique (n=16); one group each was treated with Seprafilm® (n=8), Interceed® (n=9), or Adept® (n=10). Sacrifice was on day 7 to evaluate incidence, quality, and quantity of adhesions, as expressed via adhesion reduction rate (AR). Histologic specimens were evaluated. Statistical analyses used ANOVA and unpaired t-tests. Results: 4DryField® PH significantly reduced incidence and severity of adhesions both as premixed gel (AR: 85.2%) and as in-situ made gel (AR: 100%), a comparison between these two application techniques showed no differences in efficacy. Seprafilm® did not reduce incidence but severity of adhesions significantly (AR: 53.5%). With Interceed® (AR: 3.7%) and Adept® (AR: 16.1%) no significant adhesion-reduction was achieved. Except for inflammatory response with Interceed®, histopathology showed good tissue compatibility of all other devices. Conclusion: 4DryField® PH and Seprafilm® showed significant adhesion prevention capabilities. 4DryField® PH achieved the highest adhesion prevention effectiveness without restrictions concerning mode of application and compatibility and, thus, is a promising strategy to prevent abdominal adhesions. Adhesions are a serious problem following abdominal surgery 1. They occur in about 90 % of patients wherein 10-20% of these patients develop severe health problems ranging from pain to bowel obstruction 2. The SCAR and SCAR-2 studies from Scotland showed that postsurgical adhesions after abdominopelvic surgery increased patients' morbidity and mortality with a readmission rate for high-risk groups such as colorectal surgery patients being one in five within four years 3, 4 Although progress has been made in preventing adhesion-related complications since the SCAR studies, there is still need for improved adhesion prevention. Postoperative adhesions mostly develop as a result of peritoneal injury, cell death and blood remnants, resulting in fibrin deposition 5. Surgical methods to reduce postoperative adhesion formation involve minimal tissue handling and reduced peritoneal trauma 6, 7. These strategies can help to lower but not completely prevent the incidence of adhesions. Furthermore, they are limited due to the fact that they are not always accessible and/or applicable. Therefore, the development of adhesion prevention agents and devices is essential 6, 8. Pharmacological agents are still in an experimental stage and are not yet available in surgical practice. Additionally, they bear the disadvantage of involving the whole metabolism of individuals 9. A preferable adhesion prevention device should be easy to use and exhibit its action only locally with no harm to the patient. Since peritoneal recovery is known to occur within three to five days, devices should be degraded quickly after this timeframe to avoid adverse events which could cause secondary adhesions 10, 11. Medical devices acting as local barriers have been introduced into clinical practice, but their efficiency is discussed controversially 12. Non-absorbable synthetic materials such as silicone and polytetrafluoroethylene (PTFE) have been shown to possess a certain degree of effectiveness, however, they need to be removed after some time 12. Therefore, bio-absorbable materials based on degradable components are preferable 12. Although several such degradable devices have been introduced into the market, no single product has been found wholly satisfactory so far 6, 12-14. Up to now, devices based on hyaluronic acid have shown some effectiveness. However, studies also indicate, that their use corresponds to an increased leakage rate of intestinal anastomoses, limiting their spectrum of use in abdominal surgery 15, 16. In this study, Seprafilm® (Genzyme GmbH, Germany) consisting of modified hyaluronic acid/carboxymethylcellulose applicable as a membrane was evaluated. Furthermore, Interceed® (Ethicon, USA) which is an absorbable knitted fabric prepared by the controlled oxidation of regenerated cellulose was appraised. Both, Seprafilm® and Interceed® are administered directly on the areas at risk for adhesion formation and are mainly used in open abdominal or gynecological surgery. Adept® (Baxter Healthcare Corporation, USA), on the other hand, a 4% icodextrin solution, is a liquid adhesion barrier prevention applicable for both, open and laparoscopic surgery. Delivered into the peritoneal cavity it is believed to mediate its effect by providing a temporary separation of peritoneal surfaces by hydroflotation as a result of maintaining a fluid reservoir. 4DryField® PH (PlantTec Medical, Germany) is a new plant-based polysaccharide for adhesion prevention and haemostasis. The powder is applied to the areas at risk and then transformed into a gel in-situ with a saline solution. Alternatively, in this study 4DryField® PH gel was premixed before application and can be applied in open as well as in minimally invasive surgery. Comprehensive clinical testing of adhesion prevention devices implies the necessity of a second look operation with the involved ethical problems 6, 12. Due to high variability of anatomy and diseases, standardization is extremely difficult, especially if an actual comparison of different devices is the objective12. Accordingly, animal experiments represent the alternative tool for comparative studies. Recently, we have introduced an optimized adhesion model (OPAM) proven to induce severe adhesions with high reproducibility 17. Using OPAM, 4DryField® PH applied as premixed gel could be shown as highly effective in preventing adhesion formation 18. The study presented herein uses the same challenging model to rank efficacy of the market leading adhesion barrier devices Seprafilm®, Interceed® and Adept® in comparison to 4DryField® PH applied with two different variants of application. Our study was approved by The Lower Saxony State Office for Consumer Protection and Food Safety (LAVES, Hannover, Germany; approval code 13/1095). All experiments were performed at the Zentrales Tierlabor of Hanover Medical School (MHH, Hanover, Germany). In order to provide and assure adequate life quality of the laboratory animals all protocols were conducted in accordance with national and European animal protection laws. A total of 68 male Lewis rats, weighing between 270 g and 423 g (mean 328 g ± 34 g) were used. Animals were housed under standard conditions and were fed ad libitum with a commercial diet and had continuous access to fresh water. Animals' welfare was assessed by daily monitoring of bodyweight and behavioural changes with the use of a observation chart (body condition scoring, GV-SOLAS, Charité - Universitätsmedizin Berlin, Berlin, Germany). General anaesthesia for surgical intervention was achieved using a dose of 80 mg/kg body weight ketamine and 5 mg/kg xylazine. The required level of narcosis for surgery was reached, when flexor reflexes were suppressed. In all animals, after shaving and sanitising of the abdomen a three cm long median laparotomy was performed. To induce peritoneal adhesion, the previously reported OPAM technique was used to induce severe and reproducible adhesions for testing adhesion prevention agents in a severe case scenario. In the OPAM technique, peritoneal adhesions were induced by peritoneal abrasion of the caecum and dissecting the inner skeletal muscle layer of the abdominal wall, followed by a meso-stich approximation of both injured areas 17. Prior to surgery, the animals were randomly divided into six different groups: the control group without any adhesion prevention treatment (CT, n=10); two groups were treated with 4DryField® PH in different application modes (premixed gel, n=15; in-situ gel, n=16); one group each was treated with Seprafilm® (SF, n=8), Interceed® (IC, n=9), or Adept® (AD, n=10), respectively. All products were only applied after sufficient haemostasis was achieved by time. 4DryField® PH was applied in two different application modes, both using 300 mg of 4DryField® PH per animal. One group received treatment with 4DryField® PH gel premixed extra-corporally with 0.9% saline solution resulting in a concentration of 0.25 mg 4DryField® PH per ml, i.e. 1.2 ml gel/animal (Fig. 1 C). The other group received 4DryField® PH with in-situ gel technique, i.e. powder was first placed on the sites of injury and subsequently a gel was generated in-situ by dripping with saline solution (0.9%) (Fig. 1 E and F). One group each was treated with the adhesion prevention membranes Seprafilm® and Interceed®. Prior to positioning, Interceed® and Seprafilm® membranes were trimmed according to the size of the OPAM injury and then placed to separate the abdominal wall and the abraded caecum (Fig. 2 A and C). Adept® was delivered as a liquid directly into the peritoneal cavity in an amount of 12.5 ml/kg bodyweight before closure of the abdominal cavity as demonstrated in Figure 2 E.
After surgery animals were monitored until complete awakening and kept warm with an infrared lamp. To minimise expectable postoperative pain animals received Novalminsulfone in the immediate postoperative period (non-recurring subcutaneously after surgery with 200 mg/kg body weight; subsequently by mixing 40 droplets to 500 mL drinking water). If complications had occurred (e.g. infection or inflammation), the affected animals would have been sacrificed immediately. At day seven after surgery, animals were sacrificed by carbon dioxide narcosis followed by cervical dislocation. Afterwards, the peritoneal cavity was opened by an incision at a left-sided position remote to the original laparotomy scar in order to prevent disturbing any potential adhesions. The extent of adhesion formation was evaluated by two independent observers according to the scoring schemes of Lauder et al. 13 and Hoffmann et al. 14. The Lauder scoring scheme takes into account number, strength, and distribution of adhesions, resulting in the adhesion scores: 0: no adhesions, 1: thin filmy adhesions, 2: more than one thin adhesion, 3: thick adhesions with focal point, 4: thick adhesions with planar attachment, 5: very thick vascularised adhesions or more than one planar adhesion. With the Hoffmann scoring scheme and grading scale gross adhesions were assessed and expressed as a percentage of the total de-peritonealised surface area. This was further translated into grades 0 to 4 (0: no adhesions, 1: caecum to bowel adhesion, 2: caecum to sidewall adhesion over less than 25% of the abraded surface area, 3: caecum to sidewall adhesion between 25% and 50% of the abraded surface area, 4: caecum to sidewall adhesion over 50% of the abraded surface area). Each animal additionally was evaluated for strength of adhesion formation and graded 0 to 3 (0: no adhesion, 1: gentle traction required to break adhesion, 2: traction required to break adhesion, 3: sharp dissection required to break adhesions. The extent of adhesion formation was also graded 0 to 3 (0: no adhesion, 1: filmy adhesion, 2: vascularized adhesion, 3: opaque or cohesive adhesion). These three sub-scores were summed for a total adhesion score. Photographs of the affected areas were taken from each animal for documentation purposes (20.0 megapixel digital camera, Cyber-shot DSC-RX100, Sony, Germany). For a better comparison of tested devices an 'adhesion reduction rate' (AR) was calculated. Hoffmann total and Lauder scores were set against the corresponding score of controls expressed in percentages. Values were averaged and then subtracted from 100 to allow expression as reduction rate. This means if there was no adhesion formation, the adhesion reduction rate was 100%. Specimens for histological examinations of OPAM areas, in particular of adhesions, were collected. Samples were excised en bloc, rinsed, and immersed in 4% buffered formalin. After paraffin embedding, serial sections were stained with haematoxylin and eosin or with a PAS staining kit and evaluated by light microscopy in a blinded fashion. Adhesion scores are presented in mean values with standard deviations (SD). Scores and weight data were compared using unpaired t-test and reported p values and were considered significant with p<0.05. Additionally, one-way ANOVA testing was performed for multiple comparisons of adhesion reduction rates of all treatment groups. Statistical analyses were performed with GraphPad PRISM (Version 6 for Mac OS, GraphPad Software, Inc., La Jolly, USA). Significance levels were defined as: <0.0001 = highly significant (***), <0.005 = moderately significant (**) and <0.05 = significant (*). None of the animals had to be sacrificed during the postoperative course; a total of 68 animals completed the study. Rats in all groups showed equitable viability and course of body weight. In none of 68 animals congenital adhesions were noted at the initial laparotomy. Individual adhesion scores for each group at pathological evaluation are shown in Table 1. In the control group (Fig. 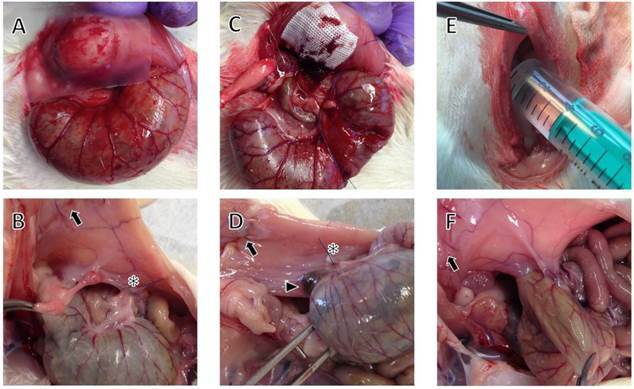 1 A and B) 9 of 10 animals developed severe adhesions and agglutination of the caecum to the abdominal wall (Fig. 1 B). Subjected to adhesion scoring systems, a mean Lauder score 13 of 4.5/5 and total Hoffmann score 14 of 9/10 was assigned, respectively. Three of 15 animals treated with 4DryField® PH premixed gel (Fig. 1 C and D) had detectable adhesions (Lauder score 0.5/5, total Hoffmann score 1.6/10). 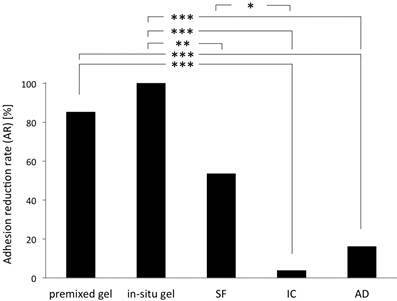 In contrast, none of 16 animals in the group with 4DryField® PH applied as in-situ gel (Fig. 1 E-G) developed any adhesions of the caecum to the abdominal wall (Fig. 1 G). This resulted in a score of 0 for both soring systems. There was no statistical difference between 4DryField® PH treated groups when comparing both adhesion scores. Of the eight rats treated with Seprafilm® (Fig. 2 A and B), seven animals revealed minor to severe adhesions (Fig. 2 B), while one was free of adhesion formation at autopsy. This corresponds with the incidence in controls. However, the severity of adhesions was reduced, as indicated by lower mean Lauder and Hoffmann scores. Following treatment with Interceed® (Fig. 2 C and D) eight of nine animals had severe adhesions; Interceed® remnants were visible in the agglutination areas (Fig. 2 D), and one rat had no adhesions. All of ten Adept® treated animals (Fig. 2 E and F) showed at least some adhesion formation (Fig. 2 F), with six of ten animals having severe adhesions. Photographs at surgery and pathological evaluation in a control animal (A and B) and animals with 4DryField® PH premixed gel (C and D) and in-situ gel treatment (E, F and G). Arrows indicate laparotomy scars, asterisks demonstrate the approximation of abdominal wall and caecum by meso-stich. (A) Site after optimized adhesion model (OPAM) surgery, i.e. creation of abdominal wall defect and abrasion of caecum. (B) Control animal at day 7 after OPAM with caecum agglutinated to abdominal wall. (C) Site after OPAM and treatment with 4DryField® PH as premixed gel. Note the meso-suture for approximation of caecum and abdominal wall. (D) Day 7 after premixed gel treatment revealing no adhesions, tip of forceps points to the area of the former abdominal wall defect. Peritoneum reveals a shiny surface in the area of the former OPAM injuries. (E) Site after application of 4DryField® PH, (F) after dripping with saline solution a 4DryField® PH gel was formed (in-situ mixed gel). (G) Site of surgery following 4DryField® PH in-situ gel treatment revealing no adhesion formation. Lauder score and Hoffmann scores (total and sub scores). Photographs at surgery (A, B, C) and pathological evaluation at day seven (D, E, F) in rats with Seprafilm®, Interceed®, and Adept® treatment. Arrows indicate laparotomy scars, asterisks the meso-stich approximation of abdominal wall and caecum, arrowhead indicates Interceed® remnant. (A) Patch of Seprafilm® is applied to separate abdominal wall defect and abraded caecum. (B) Agglutinations after Seprafilm® application. (C) Patch of Interceed® is applied to abdominal wall defect. (D) Remnant of Interceed® agglutinated to the abdominal wall on one side and the caecum on the other side. (E) Application of Adept® intraperitoneally (12.5 ml/kg bodyweight). (F) Adherence of the caecum after treatment with Adept®. Adhesion reduction rates of 4DryField® PH premixed gel, 4DryField® PH in-situ-mixed gel, Seprafilm® (SF), Interceed® (IC), and Adept® (AD). Compared to controls, 4DryField® PH treated rats showed a significant (p < 0.0001) adhesion reduction rate of 85.2% for premixed gel and of 100% for in-situ gel treatment (p < 0.0001) (no therapy failure in this group). A significant (p = 0.0035) adhesion reduction rate was also noted in animals with Seprafilm® treatment as compared to controls, whereas treatment with Interceed® and Adept® revealed no statistically significant benefit with respect to adhesion prevention (Table 1). Figure 3 shows the adhesion reduction rate (AR) of all groups in a multi comparison analysis of the adhesion reduction rates. Herein, 4DryField® PH premixed gel showed a significantly better adhesion prevention compared to Adept® and Interceed®. 4DryField® PH in-situ-mixed gel reduced adhesions significantly better than Adept®, Interceed® and Seprafilm®. Seprafilm® showed significantly better adhesion prevention than Interceed®. Taken together, the adhesion score data provide evidence for a superior adhesion prevention by 4DryField PH® as a premixed and in-situ mixed gel without significant differences between both application modes. Histopathological observations at day seven after OPAM treatment confirmed the macroscopic rating of adhesion formation for all groups. Figure 4 A gives a representative example of agglutinations in a control group animal, showing the smooth muscles of the caecum fused to the skeletal muscles of the abdominal wall via dense granulating tissue. The histological findings support the macroscopic observation that caecum and abdominal wall could not readily be separated by mechanical force. Representative photomicrographs of tissues from animals of control and treatment groups taken one week after operation. 1: cecal mucosa, 2: smooth muscle layer of the caecum, 3: granulating tissue, 4: abdominal wall musculature (A) HE-staining in a control animal with agglutination of abdominal wall and caecum (top: overview, bottom: close-up of the agglutination site of abdominal wall and caecum connected by granulating tissue). (B) animal of 4DryField® PH premixed gel group, PAS-staining: Caecum (top) and abdominal wall (bottom) show no agglutination. A slight thickening of the sub-peritoneal tissue of the abdominal wall above the former abdominal wall defect and some remnants of 4DryField® PH are visible (chevron arrowheads). (C) animal of 4DryField® PH in-situ-mixed gel group, PAS-staining: Caecum (top) and abdominal wall (bottom) show no agglutination but a slight sickening of the sub-peritoneal tissue of the abdominal wall with some remnants of 4DryField® PH. (D) Animal treated with Seprafilm® revealing agglutination of abdominal wall and caecum. (E) Interceed®-treated animal with deposits of the product surrounded by granulating tissue (delta arrowheads), via which abdominal wall and caecum are agglutinated. (F) Adept®-treated animal with agglutination of caecum and abdominal wall. Original magnification: A, top: 20x; A, bottom and B-F: 100x. In contrast, no agglutinations occurred in the majority of animals treated with 4DryField® PH irrespective of treatment with premixed or in-situ mixed gel. The wounds of the caecum and the area of the abdominal wall defect had healed, both were covered with a single mesothelial cell layer. Figure 4 B and C (top panels) show representative findings from the areas of healed caecum (B: premixed gel, C: in-situ mixed gel) without signs of the former injury or 4DryField® PH remnants. 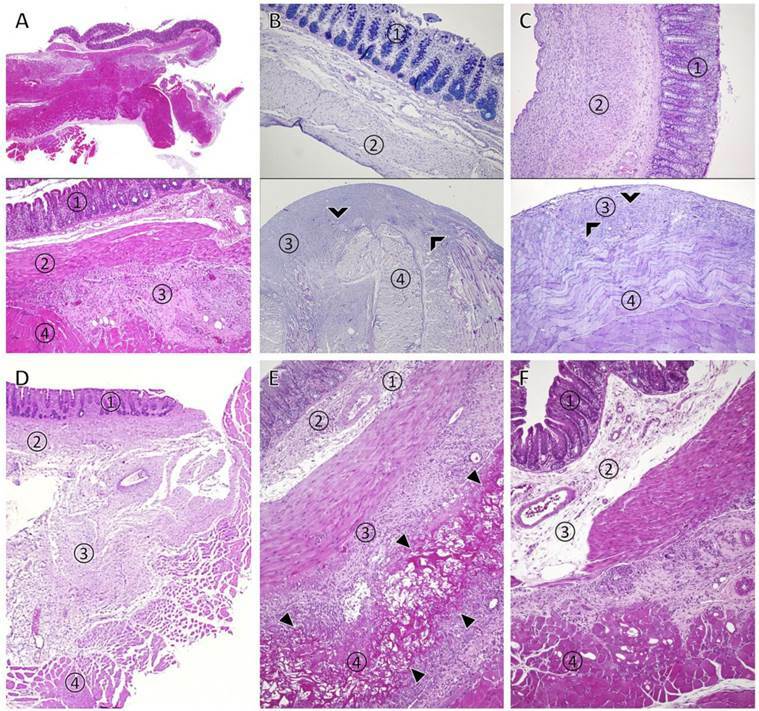 Figure 4 B and C (bottom panels) are representative histologic views from the area of the former abdominal wall defect revealing a slightly thickened sub-mesothelial layer with some remaining polysaccharide particles in varying stages of degradation in both, the premixed (Fig. 4 B) and the in-situ mixed gel (Fig. 4 C) groups. Figure 4 D shows a histological specimen taken from an agglutinated area in a Seprafilm®-treated animal. Adhesions consisted of granulating tissue like in the control group. No remnants of Seprafilm® could be detected with HE or PAS-staining one week after implantation. After treatment with Interceed®, substantial remnants of the device were present in all animals. The device was infiltrated and surrounded by mononuclear inflammatory cells, haematoma and granulating tissue were visible in this area (Fig. 4 E, arrowheads). Agglutinations in Adept®-treated animals were comparable to controls with a tight connection of caecum and abdominal wall by granulating tissue (Fig. 4 F). Remnants of icodextrin-polysaccharide were not delimitable. In sum, histologic observations confirmed our macroscopic findings. OPAM controls regularly revealed severe agglutinations. With 4DryField® PH treatment mostly a single-layer peritoneal cell coverage had developed covering the areas of injury. The sub-mesothelial connective tissue was thickened and contained sparse remnants of polysaccharide. In Seprafilm® or Adept® treated animals, agglutinations were comparable to those of control animals. Interceed® remnants were found in substantial amounts in agglutination sites associated with local inflammatory response. Adhesion formation is a clinical problem associated with increased patients' impairment and morbidity as well as considerable health care costs 1, 2. One of the most important triggers for this complication is abdomino-pelvic surgery 3, 4. Many attempts have been made to solve this burden. The pharmacological approach is still in the experimental stage 9. A number of medical devices acting as temporary mechanical barriers have been introduced into clinical practise, but none of those has been completely satisfying 6, 12-14. Decision-making for adhesion prevention strategies is complex and should be based on experimental and, if possible, clinical surveys. The present study investigates the effectiveness of four adhesion prevention devices. Although clinical proof of effectiveness is crucial, it is generally difficult to achieve in the clinical setting and animal studies provide a basis for comparative evaluation of anti-adhesive agents. Such studies allow postoperative observation of individuals and patho-anatomical analysis of macroscopic and microscopic findings. The recently introduced optimized adhesion model (OPAM) 17, which induces formation of severe adhesions with consistent reproducibility in rats, is appropriate for testing and comparing adhesion prevention devices in a worst case scenario. Recently, we used OPAM to investigate the adhesion prevention capability of 4DryField® PH. We found a 90% adhesion reduction rate 18, which can be considered as superior, when compared with results of recent experimental publications employing other devices, such as Seprafilm® 19-21, Interceed® 21-23 and Adept® 20, 23-25. In the present study, the again favourable outcome with 4DryField® PH gel, used as premixed or as in-situ version, supports the results of a previous investigation 18. Since both application techniques are appropriate, the mode of administration can be adjusted to the surgical needs without loss of effectiveness 18. Translated into clinical practice, the in-situ gel technique might be suitable for the treatment of large oozing peritoneal defects. Accordingly, large areas depleted from peritoneum as found in redo surgery for symptomatic adhesions might be treated with the premixed gel version. The histologic results showing full reconstitution of the peritoneal coverage are important since peritoneal impairment is a key factor for the induction of adhesions 11, 26. Efficiency of different adhesion prevention devices can be compared best when testing is performed in the same experimental setup, as in the present series. The observation that Seprafilm® shows some efficiency corresponds well with data recently published, indicating that hyaluronate carboxymethylcellulose reduces the incidence of reoperations for adhesive small bowel obstruction 15. However, there is information that the use of Seprafilm® might be associated with an increased risk of intestinal anastomotic insufficiency and infection 16, 27, 28. This possibly limits its clinical use in surgeries with bowel anastomoses. With the worst-case scenario of the present study, for Interceed® and Adept® a significant adhesion reduction could not be shown. The inflammatory response after Interceed® application might be due to the longer degradation time of oxidized cellulose while absorption of 4DryField® PH, Seprafilm® and Adept® is much faster, as supported by our results. However, prolonged presence of substantial quantities of Interceed® might induce an inflammatory foreign body reaction, which is known to be a trigger for adhesion formation 29. Unlike all other products, Adept® was not detectable in photomicrography (data not shown). Haematoma and fibrin bands are also known to be a potential basis for adhesion formation 10, 11. Therefore, all devices in the present study were only applied after achievement of sufficient haemostasis, as delineated by manufacturers in the instructions for use. Experimentally and clinically, secondary oozing is not always completely avoidable in larger wounds. Thus, the dual effect of 4DryField® PH providing haemostasis and adhesion prevention might have contributed to its superior results. Furthermore, this might also be the reason for the slight difference between premixed and in-situ gel. The primarily administered 4DryField® PH powder optimized haemostasis of the wound bed, the gel formed the adhesion barrier. Whilst human studies are missing, experimental data indicate that a marked reduction of peritoneal adhesion formation can be achieved with a good surgical technique, adequate pneumoperitoneum and prevention of desiccation 7. However, since these methods cannot completely prevent adhesions and are not always applicable, the use of adhesion barriers should be taken in consideration 6, 11. Manufacturers of Interceed® and Seprafilm® recommend the use of their devices for open surgery, whereas 4DryField® PH and Adept® can be applied in both, laparoscopic and open surgery. The experimental results of the present study clearly underline the efficiency of 4DryField® PH, which is already supported by initial clinical results 30. In a study on gynaecological patients with surgery for severe endometriosis, uterus disease or extensive symptomatic adhesions, 4DryField® PH was shown to be efficient, also confirmed with second look laparoscopies 30. The present experimental study on caecal adhesions provides a basis for trials in visceral surgery, known to have a high readmission rate due to adhesion-related complications, especially after colorectal surgery. In an experimental model known to induce severe adhesions 4DryField® PH gel significantly reduced incidence and severity of adhesion formation. Seprafilm® did not diminish incidence but significantly reduced adhesion severity, whereas Adept® and Interceed® demonstrated no significant adhesion prevention capabilities. With Interceed® a local inflammatory reaction was seen, whereas all other devices revealed good tissue compatibility. Due to the favourable results, 4DryField® PH gel can be recommended as a promising strategy against the burden of adhesion formation following abdomino-pelvic surgery. Corresponding author: Dr. Daniel Poehnert, PhD. Carl-Neuberg-Strasse 1, D-30625 Hannover (Germany), Tel. +49 511 5326534 Fax +49 511 5324010 E-Mail poehnert.danielde.